Applications: Silicon carbide is preferred on softer metal such as aluminium and copper as well as several non-metal applications such as wood, fillers and plastics. These discs are used on randon orbital (DA) sanders and rotary sanders. For use with hook and loop backing pads. Product Notes: Silicon carbide abrasive has a sharp grain which gives a good cut rate on softer materials. We just show 1 popular size, 150mm, here in plain disc form, for illustration. We can supply other sizes, eg 125mm in plain discs or with various hole patterns for dust extraction. Min order quantity on smaller discs is 100 per grade, but we can offer smaller quantities in larger sizes (cutting tools available to over 800mm). 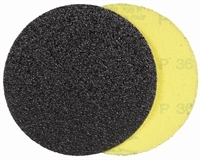 Also Available: Besides other sizes and patterns in silicon carbide we stock a wide range of alumnium oxide abrasive discs for most applications including steel and cast iron. We can also supply zirconium grip discs for use on stainless steel. The discs are for use on suitable backing pads for either DA sanders or rotary sanders.